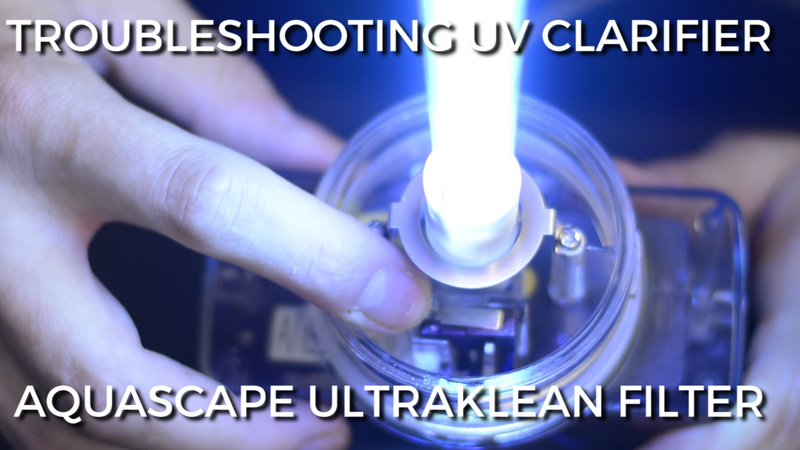 How to troubleshoot the UV clarifier in a Aquascape UltraKlean Filter Throughout the year, we get a lot of calls with, 'my UV is not working.' So, today we're going to troubleshoot one specific manufacturer, two units, Aquascape. Before we get started, and this is incredibly important, we are going to have UV bulbs that are fully exposed and lit – DO NOT STARE AT THEM. Throughout the year, we get a lot of calls with, ‘my UV’s not working.’ So, today we’re going to troubleshoot one specific manufacturer, two units, Aquascape. The UltraKlear, their in-line unit, and the UltraKlean Filter with internal UV. .
All UV lights have an indicator which shows when the unit is functioning. Sometimes these can be difficult to see - especially during the day. So, today we’re going to test each unit with the bulb fully exposed. Most UV systems have an internal trip switch. These are installed as optical safety features that won’t allow the bulb to engage unless the unit is FULLY assembled. Prior to any of these test, make sure the circuit is good and that the GFI is not tripped. Very common issues.Moving onto the UltraKlean Filter – to test we need to first remove the control board. So, with the bulb fully exposed we need to manually engage that switch. Once out, the safety switch is located just off the lamp end connector. It’s a small metal rocker switch. Gently push to engage and the bulb should light. These aren’t that difficult and are full proof methods of testing. For more information on what we discussed today, please don’t hesitate to call. I’m Joe from webbsonline.